A ‘Mother’s ruin’ cocktail that definitely packs a punch! Named in honour of the slang for gin, this recipe for ‘Mother’s Ruin’ produces a delicious alcoholic punch. Invented by Philip Ward at Death & Co in New York, it’s a firm favourite with our chef’s mum! Why not shake one up this Sunday? In a large pitcher, stir the sugar with the club soda until dissolved. 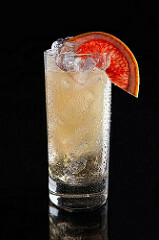 Stir in the gin, grapefruit and lemon juices and sweet vermouth and refrigerate until chilled (for about 1 hour). Transfer the punch to a large bowl. Gently stir in the Champagne and float the grapefruit wheels on top. Serve in punch glasses over ice.